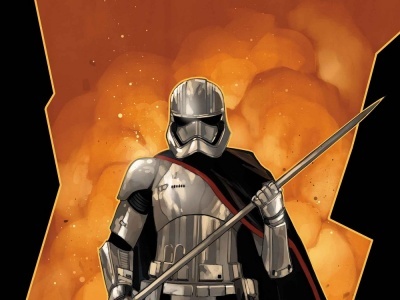 We continue the story of ReedPOP's C2E2 2014 at McCormick Place on the Chicago lakefront with our coverage of Saturday, the peak attendance and cosplay day. 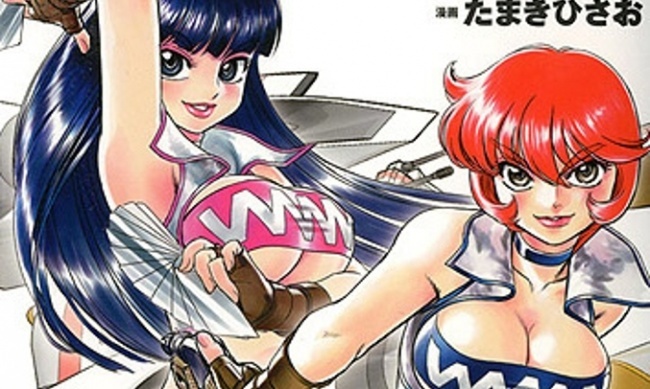 To start from the beginning on Friday, go to Part 1. At the peak on Saturday afternoon, the crowds were thick around the entrance to the floor. 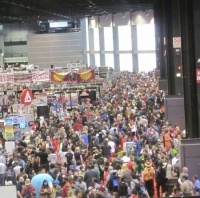 The C2E2 sign was a popular backdrop for cosplayers. 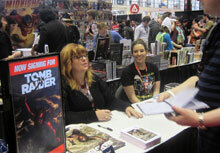 Gail Simone’s signing at the Dark Horse booth drew a huge crowd. Queen Amidala and her "handmaiden Padme" took in the sites. Regional (and now nationally distributed on Me-TV) horror movie host Svengoolie had one of the longest autograph lines on Saturday, attracting fans of all ages. Samurai Jack villain Aku was not pleased to have to wait his turn to have his comics signed. This Silent Hill nurse was guarding the elevator to the café. This mirror-ball brilliant elven character came directly from the cosplayer's own imagination, he said. Face Off champion J. Anthony Kosar had this scary fellow stalking around his Kosart Effects Studio booth as either promotion... or protection. This space marine said he spent about 280 hours of work on his StarCraft armor. 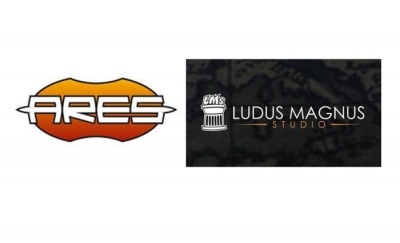 Some cool new technology at the show, including Zero Point 3D, which was on hand with its photo booth to turn cosplayers into a 3D render and create custom-painted ceramic figures using a 3D printer (available 4 – 6 weeks after image processing). Alana, Marko, and baby Hazel from Saga. 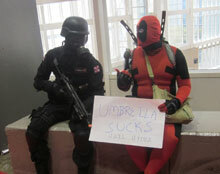 Deadpool is apparently not a fan of the Umbrella Corporation (Resident Evil). Attack on Titan’s Eren in Titan form.